Dutching football bets is a popular way of distributing profit (or liability) across a number of outcomes in a betting market. Very simply, it means to back (or lay) several selections in an event so that the profit (or loss) is exactly the same on each one. For example, a correct score Dutching system could be used to back multiple scorelines. Each one would have exactly the same amount of profit which increases your chance of winning the bet. So rather than trying to predict the correct score - perhaps 2-1 - you could Dutch 2-1, 2-2 and 3-1. I'm sure you can imagine how much easier it is to hit regular winners when backing multiple scorelines. Similarly, lay Dutching at a betting exchange places the same liability on a number of outcomes. An example would be to lay 0-0 and 0-1, then a goal for the home team produces a profit. In this article, I will explain what is Dutching, where the term comes from (probably not what you're guessing! ), how it works with football trading markets on Betfair and how to actually do it yourself. Here at Goal Profits, we also have a free Dutching calculator which you can use to work out your stakes. Firstly, Dutching has nothing whatsoever to do with the Netherlands! The name comes from the Prohibition Era in the United States. 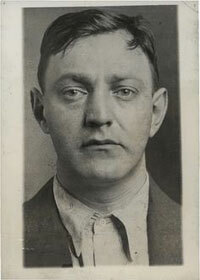 Al Capone's accountant, Dutch "Dutchy" Schultz developed the technique in order to lay horses, long before Betfair trading was available. He would bet different amounts on a number of horses so that the profit would be the same, no matter which of his horses won the race. Essentially, Dutchy Schultz was laying the horse (or horses) he didn't expect to win, by backing others in the same race which he thought had a better chance of coming home first. Similar strategies are used today by horse racing traders, such as Dutching the first three favourites. There are many uses for Dutching when betting on footb﻿﻿al﻿﻿l matches. Dutching correct scores is very popular, given that there are so many outcomes and trying to predict exact scores is so difficult. Let's assume you want to set up a correct score trade in the match between Everton and Spurs. You're pretty confident of a home win and a few goals, so you want to back 2-0, 2-1 and 3-0. You quickly enter the prices for each score into our free Dutching calculat﻿﻿o﻿﻿r and set your total stake to £100. It's then a simple task to head over to Betfair and open your positions in the correct score market. They all have the same profit (give or take a few pennies) and you're all set to trade. You could also use trading software such as Fairbot to Dutch a number of selections very quickly. Some markets are already Dutched, such as Double Chance. The Double Chance market on Betfair Sportsbook is fine when you want to have a bet. But if you prefer to trade and head over to the Betfair exchange instead, you will find that the market tends to have poor liquidity and cannot be traded in-play very easily. What you can do instead, however, is Dutch two outcomes in the Match Odds market which typically has very good liquidity. There was not much liquidity in the Betfair market close to kick-off, but you can see that the prices are similar. Having this knowledge opens up the opportunity to trade Double Chance in-play, rather than having to wait until the final whistle to find out whether my bet has won or lost. I much prefer being in control. 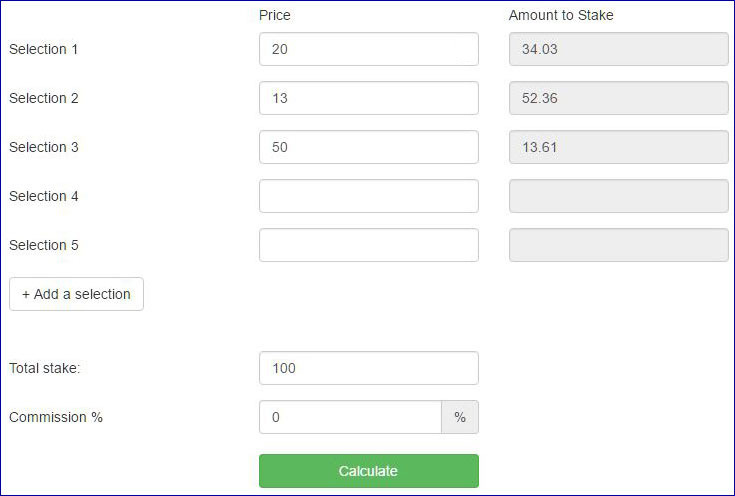 The easiest way to work out stake amounts is to use our free Dutching calc﻿﻿ulato﻿﻿r or trading software, such as Fairbot, to do the work. However, if you're a numbers geek (like me) then here are the long-hand calculations. Let's assume that you have three selections at 5.00, 6.00, 7.00 and you're going to back them for a total of £100. If any of your three selections wins, your profit will be £196.26 - £100 = £96.26. Don't forget, you will also need to account for betting exchange commission unless you are using a traditional bookie. We have three free betting calculators for you to bookmark. Quickly and easily calculate your stakes without the need for trading software. Work your stakes out quickly and easily with our free Dutching calculator, giving you equal profit across a number of betting selections. Dutching is especially useful when trading football correct scores so that you are able to cover a number of target scores. Our free hedging calculator works out your back or lay stakes quickly. 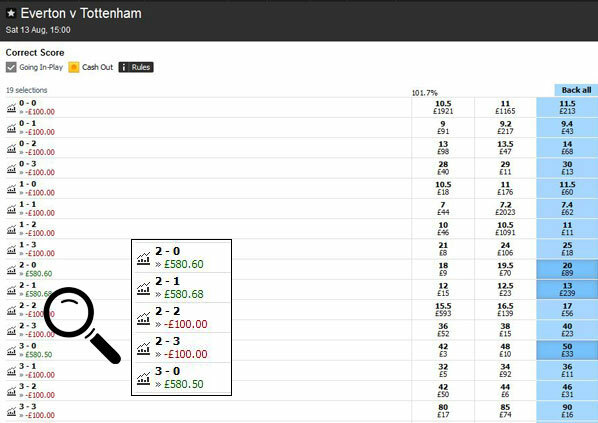 For example, if you are trading lay the draw and a goal is scored, our hedging calculator will tell you exactly how much to back the draw for so that you end up with equalised profit and the sought after Betfair 'green screen'. Use our free betting calculator to work out your winnings quickly and easily. While most traders stick with doubles and the occasional treble, our betting calculator also covers other popular multiple bet types, such as Trixie, Patent, Yankee and Accumulator. Betfair still leads the way, but the Matchbook betting exchange offers a quality service (with just 1.5% commission) if you're looking to maximise your profits.